Professor Treasure’s Secret Sky Castle: Reclaiming Riches! 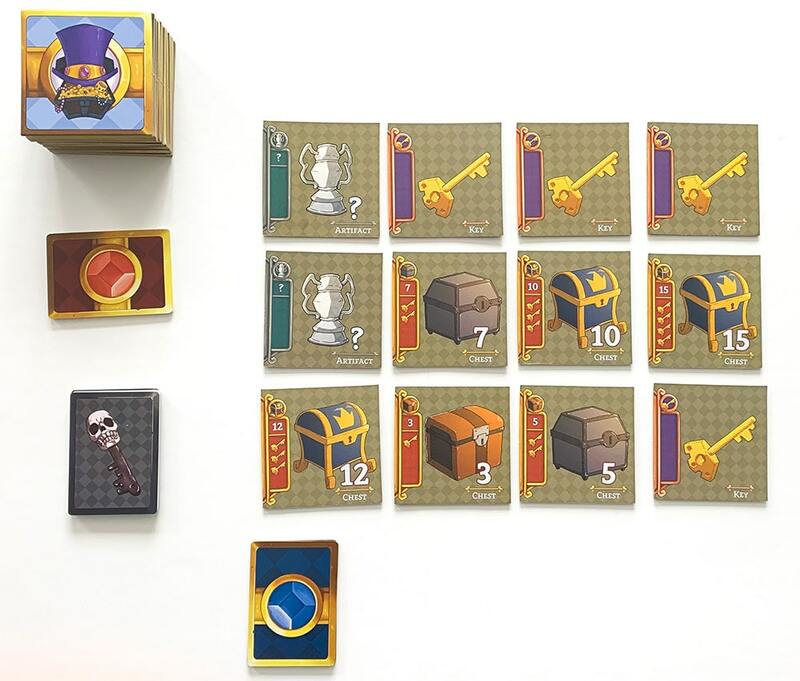 In Professor Treasure’s Secret Sky Castle, players compete over three rounds to earn the most points by collecting stolen treasures from the Professor’s Castle. It’s a puzzle-y game where you’ll need to outwit your opponent by sending adventures out with unique abilities to collect these priceless treasures. Be wary as the other team will seek to thwart you every step of way. 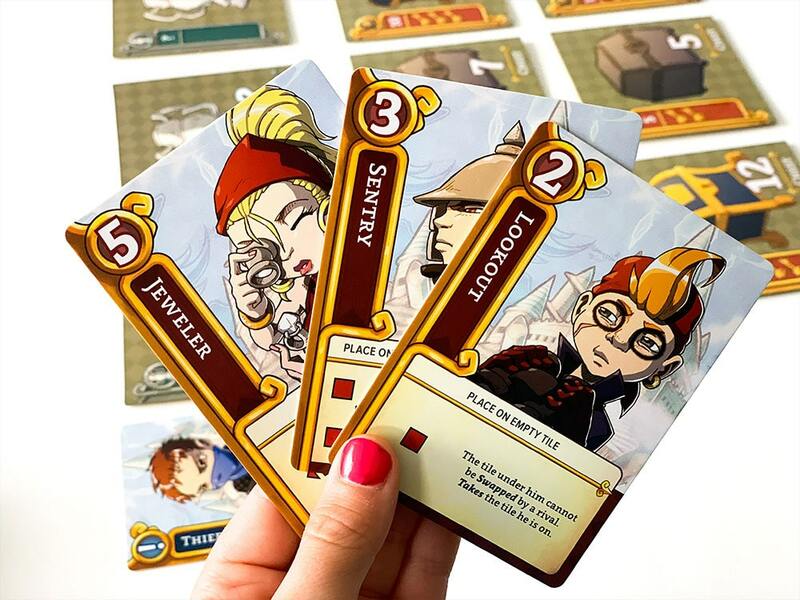 Professor Treasure’s Secret Sky Castle is designed by Jason D. Kingsley, with art by Fábio Fontes, Laura La Vito and published by Level 99 Games. This two player game takes 30 minutes or less. Shuffle the castle tiles and create a 4×3 grid of 12, this forms the Sky Castle. Place the remaining tiles and skeleton keys within reach. Each player takes a set of role cards and reference. Randomly determine a first player. Before diving into the gameplay, itself let’s take a moment to examine the different components of the game. These represent your treasure seeking adventurers heading into the Sky Castle. Each card has a activation number in the top left corner, one through seven. Each role also has placement rules and what happens when its activated. Castle Artifacts are free to claim and score points on sliding scale. 1/3/6/10/15/21/28… There is no limit to how many you may collect. Players use Castle Keys to unlock chests. They are free to claim. 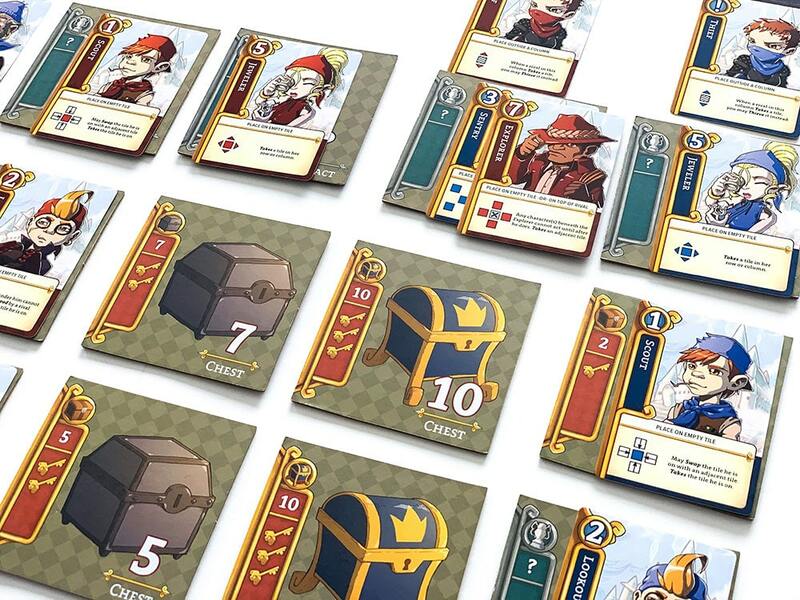 Castle Chests display their point value as well as the key requirement to claim the tile. Players can use any combination of keys and skeletons keys to claim Castle Chests. You can choose not to claim a chest if you do not have enough to cover the cost. Secret Sky Castle lasts three rounds, each broken into two phases; the Role phase and the Castle phase. Players begin the Role Phase by shuffling their role cards and discarding two at random face down. Players will not use these cards this round. Next, separate the remaining six role cards randomly into sets. The first player creates three sets of two and the second player creates two sets of three cards. Players can view all of their role cards (including discards) at any time once they’ve been discarded. 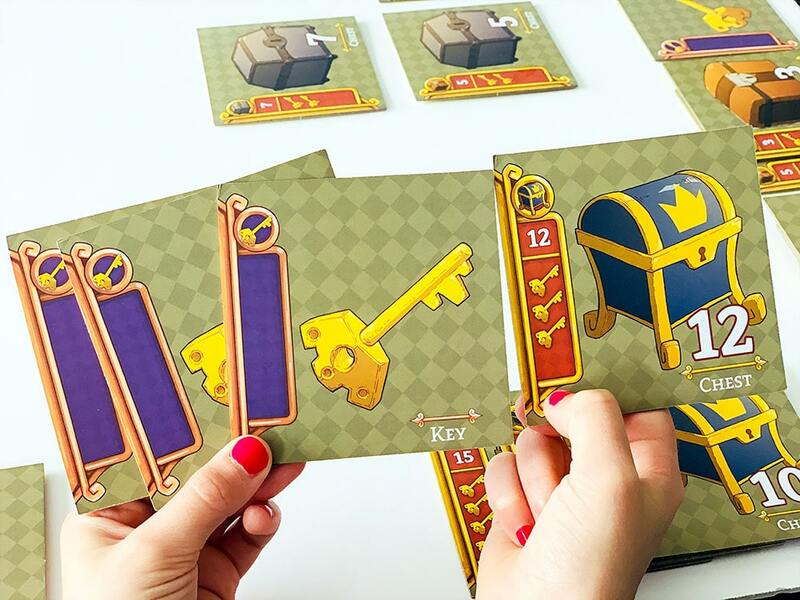 In alternating order, players select and play a set of role cards to the Sky Castle. Note that role cards cannot be placed on tiles with existing roles on them unless the role specifically states it can. The Castle Phase begins after all players place their cards. 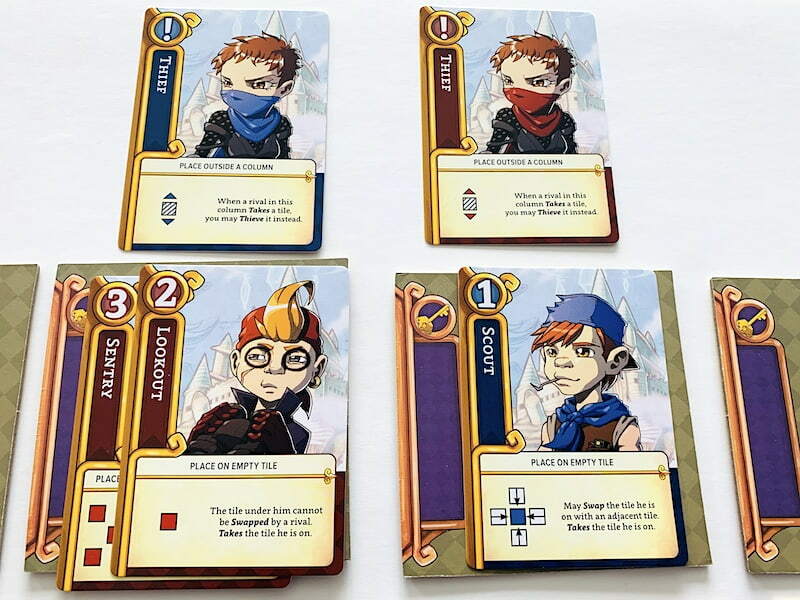 In the Castle Phase adventurers (role cards) activate in ascending order and attempt to claim treasure tiles. As the roles activate, follow the action on the card. For example: a Jeweler takes a tile in her row or column. A Scout may swap the tile he is on with and adjacent tile, then takes the tile he is on. Should there ever be a tie in role numbers, the first player’s adventurer activates first. Ignore discarded roles during the Castle Phase. Activate all roles in sequence. At the end of the round, refill the castle back to a 4×3 grid drawing from the Castle Deck. Leave any tiles remaining from the last round untouched. Then, flip over any used key tiles to refresh them for the new round. Finally, return to the Role Phase and continue play. 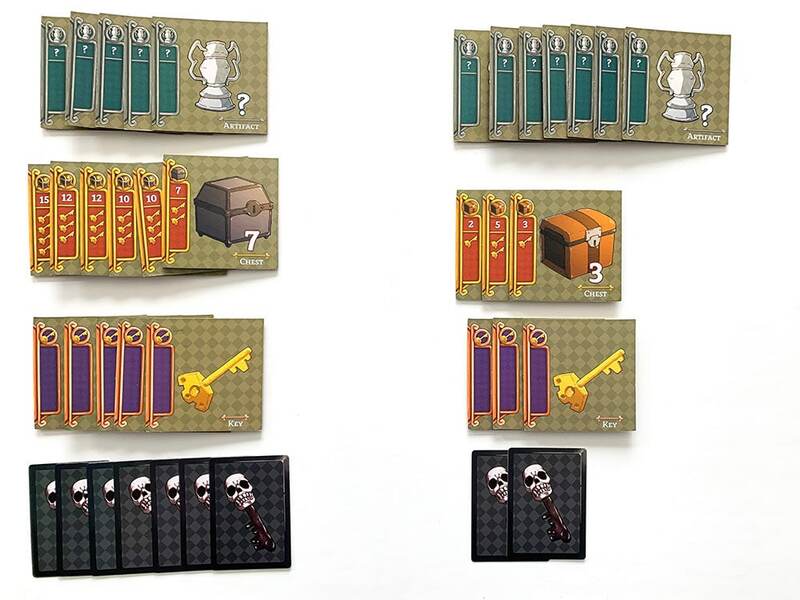 At the three rounds, players tally values of artifacts and treasure chests collected then subtract skeleton keys for their final score. The player with the most points wins. In case of a tie, the player with the most keys wins. Professor Treasure’s Secret Sky Castle was a pleasant surprise that offers a unique game play experience every single session. Aside from the random setup of the Castle each round, I loved the random selection of role cards into sets. This reduces the amount of upfront planning that needs to be done keeping the game moving along. Once random sets are made, players can the review cards and analyze the Castle and decided how to best deploy adventurers. In many cases players will need to change up their strategy after the first few roles are placed. Just when a 12-point chest seems within the grasp of one player, their competition can steal it right out from under them! Sometimes players have to make tough decisions. Is it worth taking on negative points from skeleton keys, or risk holding off to collect the chest next round? Therein lies the crux of game; go for it or play it safe, hoping to collect that hefty chest next round. While skeleton keys are dangerous, they can produce large rewards. Players must figure out how to balance negative points and get ahead. The heart of the game is action programming through role cards and will test one’s critical thinking and analytical skills. There is no age rating on the box, but my nine-year-old was able to grasp play and outmaneuver me. She secured victory in game two by no slim margin. Professor Treasure’s Secret Sky Castle is a great lightweight two player game that offers challenging decisions with high replayability. You can find Professor Treasure’s Secret Sky Castle on Amazon for $22 or at your Friendly Local Game Store! The Family Gamers received a promotional copy of Professor Treasure’s Secret Sky Castle for this review.